I first started working with leather in Kenya, with my brother, Jonathan and my sister in law, Barbara. They had a little craft shop near the beach in Malindi. I had just left school in the UK and went to stay with them. Before long I was in the workshop making engraved and tooled belts which sold in ever increasing numbers. I spent a year in Kenya and then returned home to go to university. After graduating, I realised it was the leather work that I really wanted to pursue and so I rented a stall in Camden Lock Market, selling belts that I made from home. When a shop became available I set up a workshop and expanded my range of products. Now I have been in my shop, Custom Leather, for nearly twenty years and I’ve learned a tremendous amount about leather and leather craft. I use traditional hand tools for everything I make and an ancient industrial sewing machine to stitch together the pieces. I strive to make the best quality products that I can. Things that will last and grow more attractive with age. I am interested in the details and will spend time ensuring my work is properly finished. 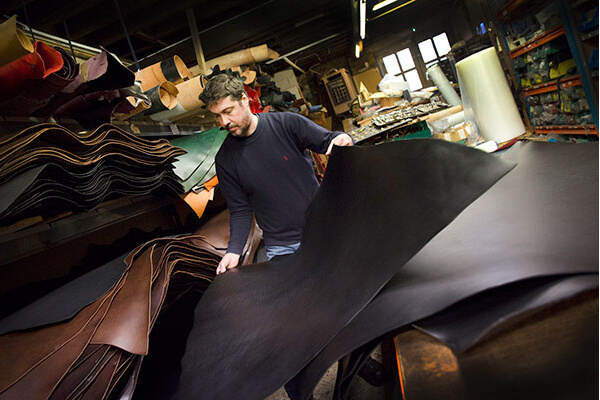 Finally, I personally select the leather that I use, which ensures that the items I make are made from only the very best quality hides.